Let’s just get this out of the way: Dead Cells isn’t really a Metroidvania. And that’s fine, because it’s a really good roguelike! But if I’d played it before this week, I might have felt weird including it in my Month of Metroidvanias. In reality, Dead Cells has much more of the modern roguelike’s DNA, complete with permadeath, procedurally generated levels, and some overarching progression mechanics that help players feel more powerful and capable across multiple runs. But despite having the standard formula of a modern roguelike, it also has a couple of major mechanics that it borrows from Metroidvanias, using them to great effect to hone and enhance this formula. But first, let’s talk about the basics. Dead Cells is a recent early access graduate by French studio Motion Twin. It makes a strong first impression with incredibly slick pixel art, kinetic and fluid animations, and a sturdy soundtrack with a rhythm that drives its movement and combat. Despite the repetitive nature of the roguelikes, Dead Cells’ art truly holds its ground. Each zone in the game has a distinct and evocative look, gorgeous lighting and sprawling parallax backgrounds, and very hummable backing tunes. The minor story interactions and occasional lore rooms don’t do a whole lot, but they drop interesting worldbuilding tidbits and tend stay brief and out of the way. The player character will play along with most of these interactions using a few emotive animations (a shrug, a thumbs up, etc.) to convey their feelings (as they don’t actually have a mouth). These animations can get a little old, but have a silliness to them that offsets the morbid tone of the game and complements its brightly-colored-grimdark aesthetic. The backdrops in Dead Cells have no shortage of impressive spectacles. Movement in Dead Cells feels quick and responsive. Most attack animations can be cancelled almost immediately by dodging, and a lot of inputs like dodges and combo attacks are generously buffered as you move between animations. The resulting action feels very smooth and continuous while still being interruptible and reactive, allowing for desperate last-split-second dodge rolls. 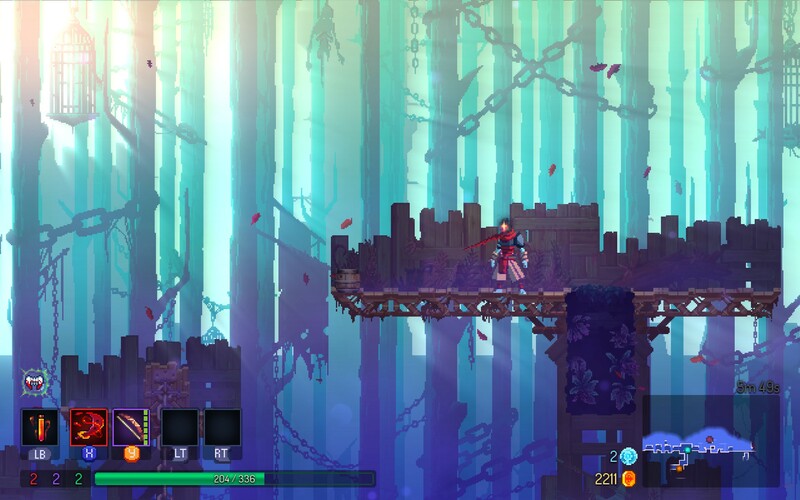 Typical games with Metroidvania-style upgrades tend to start players off with slow, clunky movement and then build them into a high-flying acrobat; Dead Cells instead starts players off extremely mobile, focusing its upgrades on interacting with pieces of the environment in order to access new paths and hidden treasures. This focus shift is crucial for dulling the pain of starting a new run with no gear or stat and skill upgrades, and helps keep a sense of momentum. Combat consists of deploying a number of ranged and melee weapons as well as shields and special attacks with a huge variety of effects, from simple grenades to elaborate traps and turrets. Each of these tools scales with one of three basic stats, which can be improved throughout a run. Playing through areas results in occasional random drops of weapon blueprints, which can then be turned in at each checkpoint to help increase the pool of available gear drops that will be discovered in current and future runs. There are additional mechanics to increase the likelihood that this gear will drop with better base stats, and be more upgradeable. The sheer variety of weapons, combined with other systems like mutations (which provide passive upgrades to damage or survivability), create a huge diversity of possible playstyles and a lot of space for experimentation. That covers Dead Cells’ foundations, which are extremely solid. But what makes it truly brilliant is the way it incorporates Metroidvania elements to even further diversify subsequent runs. 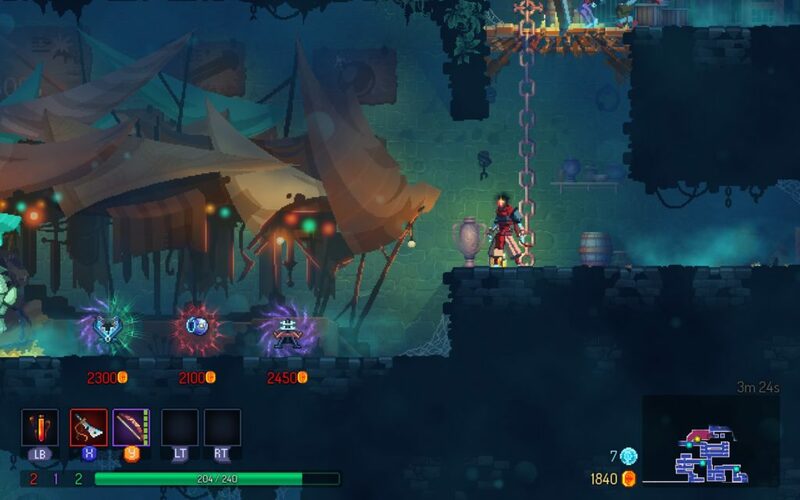 Dead Cells tucks permanent, Metroidvania-style upgrades away in corners of its various areas, to be acquired by defeating tough elite enemies. Unlocking these abilities allows the player to interact with various parts of the environment, ultimately opening branching paths and entirely new routes towards the endgame. New areas will be discovered not just at the furthest reaches of a run, but also as newly-accessible branches in earlier zones. The branching paths have similar appeal to the interconnected worlds and rewarding backtracking that traditional Metroidvanias bring to the table. They mean that the game’s true progression through its various areas actually involves a tangled web of upgrade discoveries and searches for previously-inaccessible paths, connecting the zones across multiple runs. These adapted mechanics are where it imbues itself with a rewarding Metroidvania flavor and provides unexpected facets of discovery and variety. 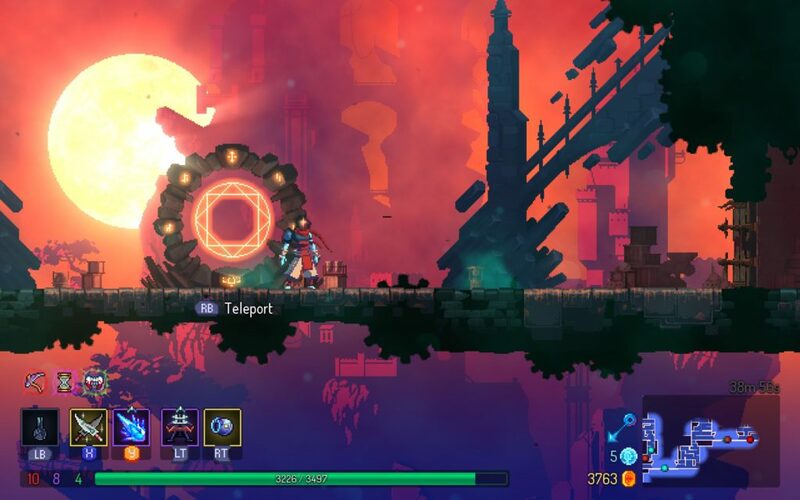 While Dead Cells takes some time to really start to unfold in this way, it provides plenty of variety right out of the gates to help you get there. Shops selling weapons can be found throughout the various zones, providing additional chances to swap out gear. While I mostly have good things to say about Dead Cells, it does have a few loose ends that are worth mentioning. The Survival stat and associated perks don’t seem to measure up to the other two in effectiveness. Bosses sometimes feel more like a rush to win before getting hurt too badly than a skillful matchup. And often late-game enemies can be so strong as to be only approachable by focusing them down in mere seconds or placing traps and running away. But the game has continued to provide me more and more tools to experiment with, and there are several areas I’ve yet to see at all. While I’ve come close to beating the game, I haven’t quite pulled it off. And honestly, I’m more excited for the new discoveries along the way than I am for another chance at victory. There are more design choices in Dead Cells that I could praise, like its timed doors that give extra incentive to move quickly, or some of the other optional challenges and risk-reward interactions. But what makes it particularly special is how it demonstrates the versatility of Metroidvania elements as game design tools. It adapts these elements to its own formula, using them to augment an already-engaging roguelike and build a game that’s truly a joy to keep picking up and struggling through, run after run. Very rarely do roguelikes manage to get their hooks in me, and I’m pleased to say that Dead Cells has absolutely pulled it off.